According to the Stewards of the Upper Mississippi River Refuge, all three of the birds, Valor I, Valor II (dads) and Starr (mom) "take part in nest maintenance, incubation and raising the young." The Illinois family is a rare example of an eagle trio cooperatively nesting, raising their young. Proof that families come in all shapes, sizes and species, three eagles - two dads and a mom - are raising three, fluffy-feathered eaglets in a nest near the Mississippi River this spring. 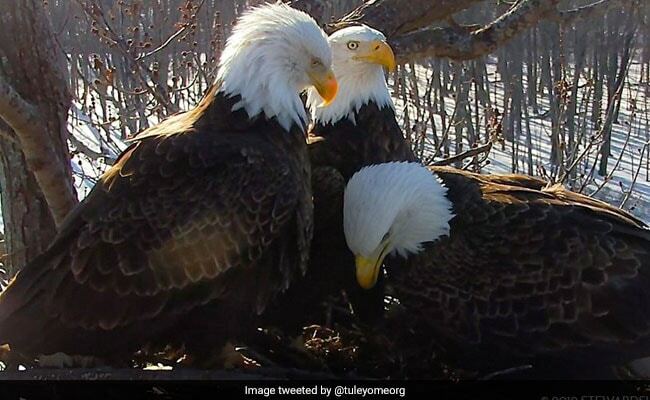 The refuge hosts a live webcam of the Illinois family, which is a rare example of an eagle trio cooperatively nesting, raising their young together. While not unheard of, such trios have only been documented a few times according to the National Audubon Society, in Alaska in 1977, in Minnesota in 1983 and in California in 1992. What might make this all-American family different is that both males are copulating with the mom, whereas earlier examples of a second dad may have only been a live-in nanny situation, with no role in the reproduction itself, Audubon reports. Domestic life in this nest was in turmoil before Valor II arrived, and it has only been two years since the dad duo lost their first partner, Hope. When Hope and Valor I began nesting at this location, Valor I "wasn't a very good partner or father," Audubon wrote. "He was irresponsible about incubating the eggs and feeding the eaglets, which were really his only two jobs." "Normally they will switch roles, but what happened was Hope would sit on the nest for a long, long time," Pam Steinhaus, the visitor services manager at the refuge, told Audubon. "Valor I would never bring food in, so she'd have to get up and leave to hunt." He'd hang out on the nest for 10 minutes - then get up and fly away. Which is probably why everyone in the nest was cool with Valor II stepping up. "I think Hope didn't care for what Valor I was doing, so he got replaced," Steinhaus told Audubon. Even after Valor II moved in, Valor I stayed. Buy 2016, the trio was "cooperatively nesting." Even Valor I was contributing, apparently motivated by his new male counterpart. But the happy nest didn't last long, with Hope disappearing in a true-crime, Unsolved-Mysteries kind of way. The dads lost their first partner when two other male eagles attacked their nest last year. It was all captured on video and documented by the Stewards of the Upper Mississippi River Refuge. On the evening of March 24, 2017, the stewards wrote, two adult eagles attacked the trio's nest. The attack lasted for more than an hour, they say, and video "shows two adult eagles battling on the ground in a desperate talon clinching struggle." When the dust settled, Hope was gone - vanished without a trace. "The searchers found no sign of Hope nor of feathers on the ground where the struggle occurred, the stewards wrote. Two days later, two more eagles (unclear if it was the same pair) attacked the nest for a second time. "Valor I and Valor II boldly defended the chicks and prevented the marauding eagles from entering the nest and no injuries were observed," the stewards wrote. "Daily attacks occurred throughout April with an occasional flyby in May." That story has a bittersweet ending - the dads continued to raise their kids together, without Hope. The eaglets fledged at the end of May. The dads chose to stay together, and found a new partner in Starr that fall, which they have been with since.